At eWedding, online at ewedding.com, create your very own wedding website. 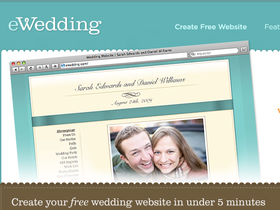 eWedding offers multiple features that you can add to your website. eWedding even offers complete set up packages for your ultimate wedding website. Choose from a huge selection of different themes to make the perfect website for all your guests to visit and fall in love with. So get your wedding website started on eWedding. Remember to check out RetailSteal to find the best eWedding coupon codes, eWedding promotions, and eWedding discounts. Shipping and handling rates do not apply to the products offered on eWedding. Hurry over to eWedding and save $30 on the platinum annual package. Buy a silver, gold, or platinum annual package from eWedding.com and they'll give you 2 months for free. Check out eWedding.com and enjoy a free domain name with select website packages. Receive a free wedding gift with your annual account at eWedding.